The global Internet governance debate is heating up again. In light of the International Telecommunication Union's (ITU) 2014 Plenipotentiary Conference, many observers are revisiting what happened at the last major intergovernmental ITU meeting: the 2012 World Conference on International Telecommunications (WCIT), which ended in a dramatic split. One of the fault lines that emerged at the WCIT was whether the revisions to the text of a key treaty would expand the role of the ITU — a specialized agency of the United Nations — to include more Internet governance functions. The 89 countries that voted in favor of the revised text, including China and Iran, were portrayed as supporting a greater role for governments in the Internet’s global multistakeholder system. Those who refused to sign, including the United States and many of its allies, argued that the new treaty threatened the existing system and the promotion of a free and open Internet. The division at the WCIT, however, was not as simple as countries that support a multistakeholder model of Internet governance vs. those who seek greater governmental control over the networks and protocols. Many countries fell in the middle, casting their votes for other political, economic, or security reasons, and if they were to shift positions going forward, could have a significant impact on the future of the Internet. These so-called “swing states” have thus become an important focus of the post-WCIT discussion, especially in advance of the ITU Plenipotentiary. In this map, we highlight the conflict and identify 30 key swing states based on a recent study for the Centre for International Governance Innovation, which attempted to systematically identify these potentially influential countries based on their WCIT voting record, their membership in groups like the Organisation for Economic Cooperation and Development, the European Union, and the Freedom Online Coalition, and a range of other indicators. Explore the map in a new page. Data Source: Tipping the Scale: An Analysis of Global Swing States in the Internet Governance Debate. What happened at the 2012 World Conference on International Telecommunications? In December 2012, government officials from all over the world gathered in Dubai for the WCIT. The purpose of the WCIT — a two-week meeting hosted by the ITU, a specialized agency of the United Nations — was to renegotiate International Telecommunications Regulations (ITRs), a treaty which governs global interconnection and interoperability of telecommunications traffic. One of the key dividing issues was a fundamental question about whether the scope of the ITRs would be expanded to cover the Internet. Many feared that giving the ITU a larger role in Internet governance could result in greater governmental control of the Internet and would ultimately harm an open and free Internet. After nearly two weeks of debate between some 1,600 diplomats from 151 states, negotiations broke down in the final days of the WCIT. Although the word “Internet” itself was not added to the text of the treaty, a reference to “unsolicited bulk communication” (otherwise known as SPAM) did make it in, and there was a great deal of confusion over the late-night adoption of a non-binding resolution on the Internet. States usually operate by consensus at the ITU, rather than formally voting, but the WCIT was an exception, with Iran and other countries pushing for a vote despite the fact that not all states had coalesced around the revised treaty text. In the end, Ambassador Terry Kramer, the head of the U.S. delegation, announced that “the U.S. is not able to sign the document in its current form,” and the conference ended in a diplomatic éclat with 89 states signing the new ITRs and 55 others (including the United States and many of its allies) publicly opposing them. Many observers noted that the split hardened the division between two opposing camps in the Internet governance debate: proponents of a status quo multistakeholder Internet governance model, like the United States, who argued that the existing system was the best way to preserve key online freedoms, and those seeking to disrupt that multistakeholder model for a variety of political and economic reasons, including governments like Russia and China pushing for greater national control over the Internet. Caught in the middle were a large number of countries trying to figure out which system could help them better address the numerous hurdles they face, particularly with respect to promoting infrastructure investment and affordable access to the Internet. Against this backdrop, a key aspect of the post-WCIT discussion has centered on the role of “swing states” in the global Internet governance debate. While much of the initial focus coming out of the meeting targeted predefined groups of countries (such as the IBSA nations) as potential game changers, or was based on anecdotal evidence about countries aligning themselves based on the strength of their tech sectors or pre-existing diplomatic relationships, a report by the Open Technology Institute’s Tim Maurer and Robert Morgus for the Centre for International Governance Innovation applied a more systematic approach to the analysis of these shifting diplomatic coalitions. Tipping the Scale: An Analysis of Global Swing States in the Internet Governance Debate (published May 2014) identified a core group of 30 potential swing states based on their voting behavior at the WCIT, their various memberships in international organizations, and a range of relevant indicators. How did Tipping the Scale identify the key “swing states” in Internet governance? Tipping the Scale moves beyond previous analyses by applying a more systematic approach using the voting record at the WCIT as a baseline. The report starts by defining a swing state in foreign policy as “a state whose mixed political orientation gives it a greater impact than its population or economic output might warrant and that has the resources that enable it to decisively influence the trajectory of an international process,” and focuses on the 193 United Nations members. In analyzing the data on the 144 states that voted at the WCIT, the report identifies two blocs: a group of EU, Organisation for Economic Co-Operation and Development (OECD), and Freedom Online Coalition (FOC) members who voted against the revised ITRs on one side, and a group of authoritarian (according to the Economist Intelligence Unit’s Democracy Index) and/or not free (according to Freedom House’s Freedom in the World Index) countries who voted in favor of them on the other. The report excludes these countries — with six exceptions — from further analysis based on the fact that they lack a “mixed political orientation.” In addition, least developed countries and very small countries with a population of fewer than two million were excluded from further analysis on the assumption that these states lack the “resources required to be able to influence an international debate.” With the number of potential swing states narrowed to 54 countries based on these exclusions, the report then uses a series of tests to rank these swing states, eventually landing on a list of the top 30 swing states in Internet governance. The top 30 states are considered swing states for one of four reasons. The first group consists of 13 states that publicly opposed the ITRs at WCIT but were not members of the EU, OECD, or FOC (including Belarus, an authoritarian and/or not free country, which is one of the six anomalies). The second and third groups consist of OECD and FOC members that voted for the ITRs. These five countries are considered swing states based on the assumption that their previous commitments to statements of the OECD and FOC supporting an open and free Internet will put them under significant pressure to change their behavior in this space. The final group of swing states was based on an analysis of 12 indicators relevant to Internet governance policy making. These indicators include proxies for states’ propensities to cooperate internationally, their political systems and civil society profiles, Internet access and presence of a tech economy in states, and an active government interest in Internet policy. Using these categories, the authors ranked each of the remaining 38 potential swing states based on each indicator. Those that featured in the top 15 of six or more indicators were considered top swing states. This process identified 12 additional states for a top 30 list of global swing states. The role of these global swing states is becoming increasingly important. Two years after the WCIT, the next big ITU convening is upon us: the quadrennial plenipotentiary meeting, taking place in Busan, South Korea from October 20 to November 7. And recent events have brought several key issues to the center of the Internet governance debate, including the ongoing fallout after the Snowden disclosures and evolving global conversations about the future of net neutrality. In particular, news about NSA surveillance has revived proposals from both Russia and Brazil for global management of technical standards and domain names, whether through the ITU or other avenues. In some cases it has also prompted developing countries, many of whom have traditionally aligned with the U.S. and prioritize access and affordability as top policy issues, to reconsider their stance. Meanwhile, countries like Brazil have emerged as leaders in the space, by convening the NETMundial Global Multistakeholder Meeting on the Future of Internet Governance in April and demonstrating that they are willing to reconsider their stance since the WCIT. Clearly, the dynamics of the global Internet governance debate are shifting at a time when critical decisions that can influence the future of the multistakeholder model are being made at both the ITU and beyond. How does this affect what’s happening at the ITU Plenipotentiary conference? Unlike the WCIT, the Plenipotentiary Conference (often referred to informally as “the plenipot”) is not a dedicated to treaty negotiations. Rather, it’s a meeting held every four years at which ITU Member states “decide on the future role of the organization, thereby determining the organization's ability to influence and affect the development of information and communication technologies (ICTs) worldwide.” During the event, member states set the ITU’s general policies, adopt four-year strategic and financial plans, and hold elections for a variety of leadership positions. The last plenipotentiary conference took place in Guadalajara, Mexico, in 2010. The preparation has been underway for months, with both regional telecommunications organizations and individual member states working to consolidate views and make proposals for consideration at the conference. On the ground in Busan, government-led delegations discuss and negotiate these proposals for three weeks, considering a wide-range of issues including the role of the ITU in Internet public policy and what the breadth of its activities should be. Some of the critical questions are definitional, such as how the phrase “ICT” is defined and used throughout various ITU documents, which directly impacts the scope of the ITU’s work on Internet-related topics. Other issues will likely emerge in the process of revising or adding new plenipot resolutions that relate to the Internet, including resolutions on IP-based networks, cybersecurity, and domain-name management. Although the prospect of an actual vote at the plenipot seems unlikely — decisions are normally made by consensus at the ITU, making what happened at the 2012 WCIT incredibly rare — it’s clear that understanding the role of these “swing states” and their priorities is becoming increasingly important in the global Internet governance debate. 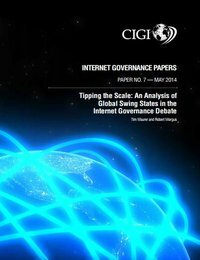 For more on the concept of swing states in Internet governance, read the full paper, published through the Center for International Governance Innovation, Tipping the Scale: An Analysis of Global Swing States in the Internet Governance Debate.